You may have noticed that most of my hamantaschen ideas are of the savory sort. I’ve got triangular dinners, appetizers, and sides covered, but I don’t really touch on the desserts. It’s probably because I myself am not really a dessert person. I would definitely rather have another steak for dessert rather than most sweets or pastries. Of course, there are a few exceptions, like chocolate souffle (my favorite to get at Le Marais in NYC), fruit tart, cheesecake and strawberry shortcake. 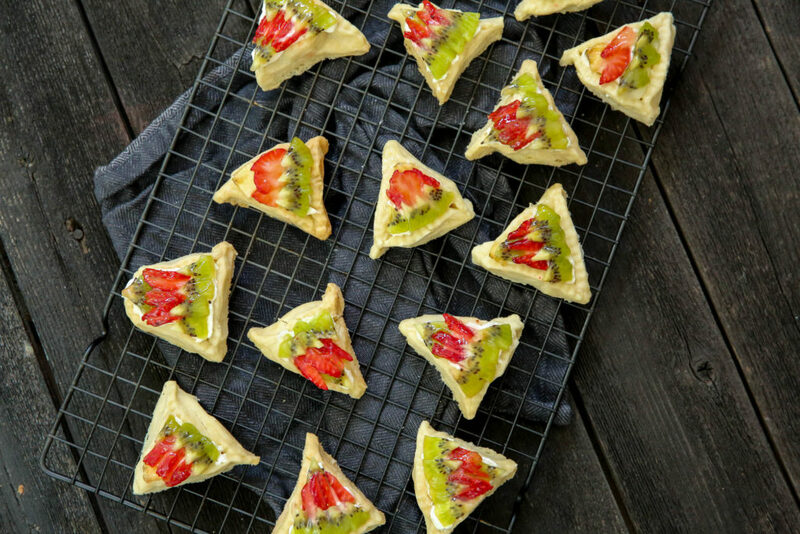 That’s why last year I came up with the cheesecake and strawberry shortcake hamantaschen— and they were amazing! Go check them out! So this year, after already coming up with a bunch of savory ideas, I figured it was time for one or two that appeal to everyone’s sweet tooth. My two other favorite desserts — chocolate souffle and fruit tart— were my starting points. After giving chocolate souffle some serious thought, I decided I wasn’t really feeling it. Maybe next year. So that left the fruit tart! I have a great parve recipe that I developed previously, so all I had left to do was see if it would work in a hamantasch form. Much easier said than done! Fruit tart dough is notorious for puffing up, since it gets baked blind (a fancy term for pre-baking the crust). I usually use beans over parchment paper to help tart crusts keep their shape before they have any filling. So for my first attempt, I filled the empty space in the hamantaschen with beans directly and put it to bake. I realized I made two critical mistakes. Since the dough wasn’t contained in a pie tin, the sides collapsed outwards. And to make matters worse, the beans stuck to the dough and I had to pry them out, equaling in a crumbled former shell of a tart. So that did not work. In my second attempt, I sprayed PAM inside the hamantaschen before placing the beans. (If you’re wondering why I didn’t just place parchment paper under the beans, I didn’t want to deal with cutting out a million triangle shaped pieces of parchment paper.) I used folded-over aluminum foil around the edges, acting like a pan. The edges stayed up perfectly but my beans STILL stuck to the inside, so that clearly wasn’t going to work. On my third attempt, I finally got it right! I used the aluminum foil again to keep the sides up, and used well-oiled balls of aluminum paper inside to keep it from puffing up. As the saying goes, third time’s the charm! With my dough all figured out, the filling and toppings were a breeze. I used seasonal fruit to top and a delicious lime glaze to finish it off. I will say, that this was not the easiest of recipes. 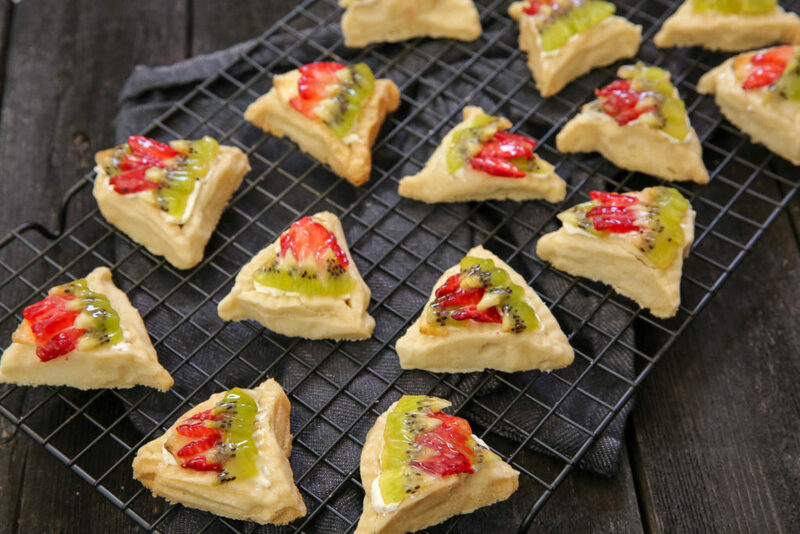 If you’re looking for a challenge or if you’re like me and fruit tart is one of your favorite desserts, then definitely give this a shot for Purim. 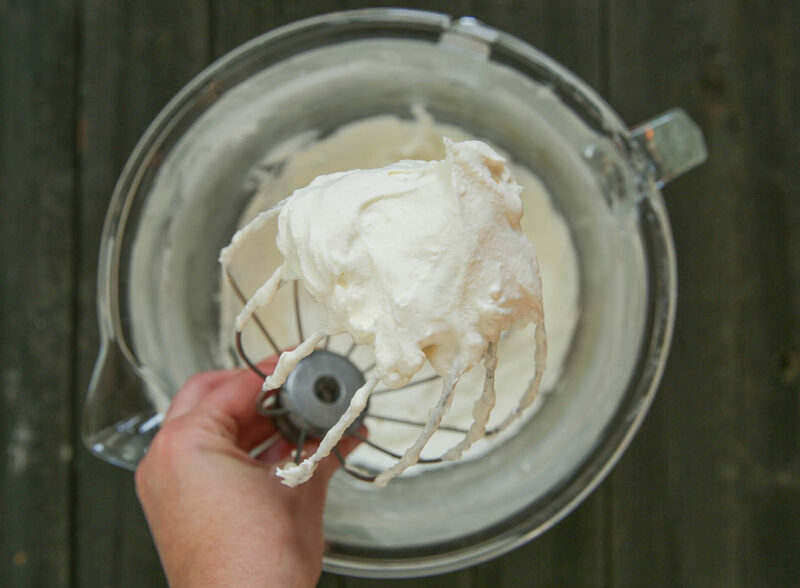 In a food processor, combine the confectioners' sugar, flour, and butter, and process until the mixture forms a ball. Separate the dough into 6 equal pieces. Roll out each piece one at a time on parchment paper near the edge. It shud be long and narrow enough to be able to only cut out one circle per row, you will need to peel off the parchment paper by lifting it so that the dough doesn't break. Using a cookie cutter or the top of a drinking glass cut a circle, peel it off, shape into a hamantasch and place on a parchment-lined baking sheet. Fold aluminum foil into thin walls (see picture) and go around each hamantasch. 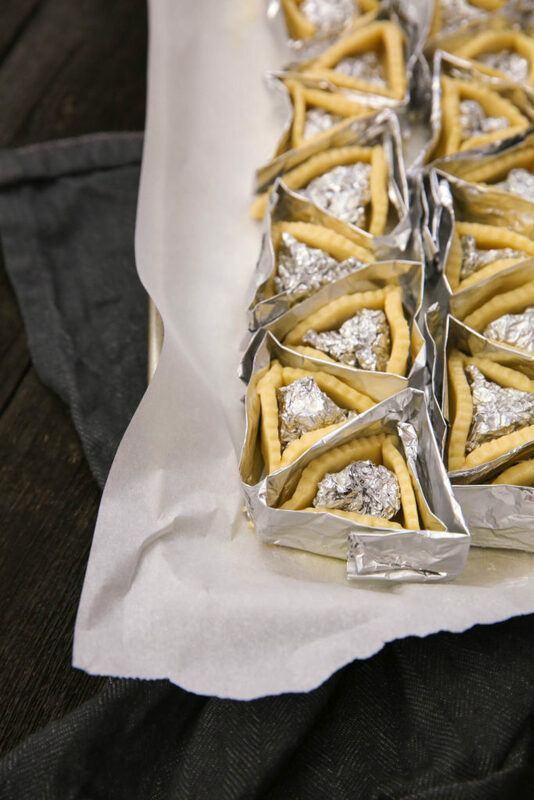 Ball up aluminum foil, spray with PAM and insert into the empty center of the hamantaschen. Refrigerate the baking sheet for 25 minutes. Bake for 13-16 minutes, until very lightly golden. Set aside to cool. Beat the cream cheese, sugar, and vanilla together until smooth. Separately beat the heavy cream until stiff peaks form. Fold the whipped cream into the cheese filling. Pipe the filling inside the cooled hamantaschen and smooth out the top. Arrange the thinly sliced fruit any way you would like. Combine the limeade juice, cornstarch, fresh lime juice, and sugar in a small saucepan and cook over medium heat until clear and thick, about 2 minutes. Let cool. 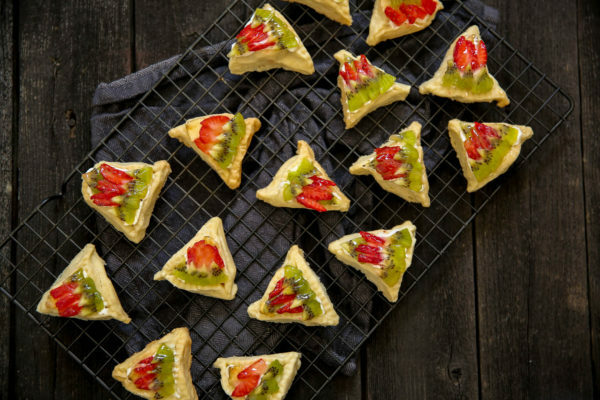 With a pastry brush, glaze each hamantaschen tart. 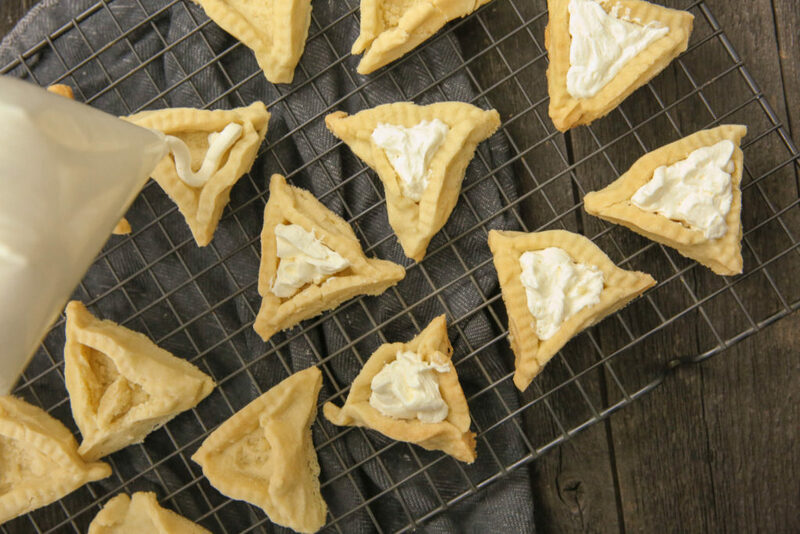 Keep the tart hamantaschen in the refrigerator and remove about 15 minutes before serving. You can use all non-dairy ingredients to keep this tart parve. Use Tofutti's soy cream cheese for the cream cheese, Smart or Earth Balance for the butter and a nondairy heavy cream. Next post Welome to JoodietheFoodie.com!